The latest easing cycle in South Africa, which began in 2008, coincided with quantitative easing (QE) in first world markets. This form of monetary policy kept bond yields artificially low for a protracted period of time, in the hope of stimulating economic growth. It is widely anticipated that this unusual form of monetary stimulus will come to an end in the latter part of 2014, placing upward pressure on bond yields. This is likely to coincide with interest rate hikes locally. Investors, therefore, need to consider the investment implications of a normalising yield environment. 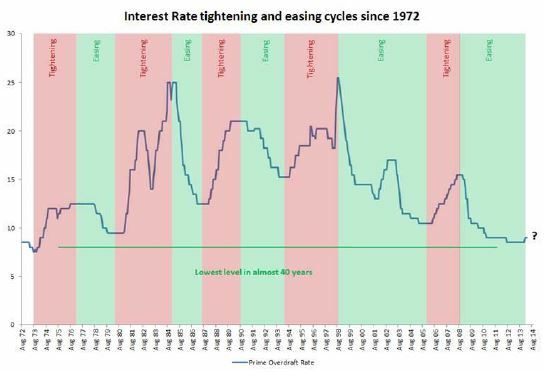 It is clear from this table that markets performed better during periods where interest rates were declining. During tightening cycles, on average, cash fared well relative to other asset classes, while bonds performed the worst. With an expectation of rising bond yields going forward, this trend is set to continue. Given the high correlation between bond and property performance, we would urge investors to exercise caution with fixed interest bonds and listed property, at this point in the interest rate cycle. Consumers are expected to face continuing pressure as interest rates increase and this will be exacerbated by the fact that consumer confidence is close to its lowest level in almost 10 years (according to the FNB/BER Consumer Confidence Index). With the consumer under pressure, earnings growth from companies in South Africa will be subdued. Given this outlook, combined with demanding valuations, it suggests that investors need to reduce their return expectations for local equities in the years ahead. Minimise exposure to fixed interest bonds and listed property. Invest in companies that offer basic necessities, such as food, telecommunication and healthcare. These businesses are defensive and will be able to grow their earnings, regardless of a consumer slowdown. Consider some exposure to first world equity markets, where valuations are attractive and investors could find diversification benefits.